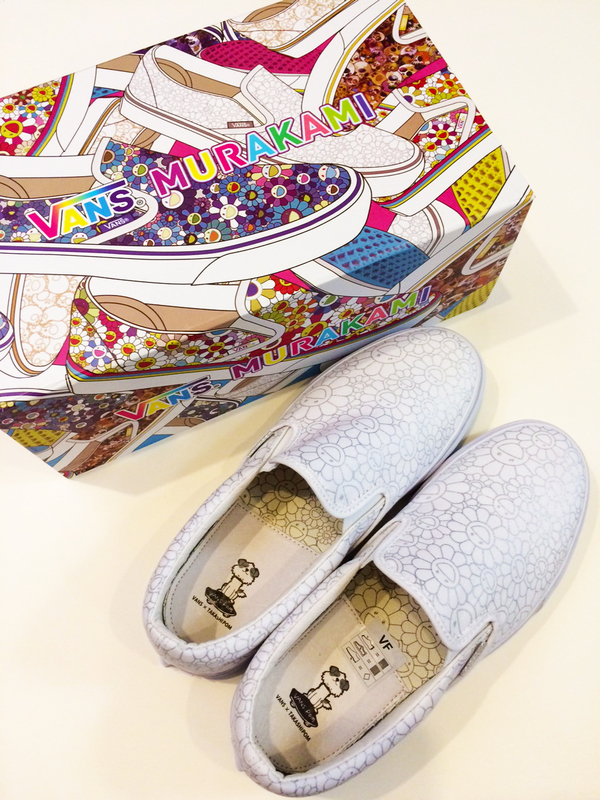 Purefecto: Takashi Murakami + Vans = Love! This past Saturday had been one of the busiest day for sneaker heads across US. Apparently two collaborations decided to drop on the same date: Yeezy for Adidas and Takashi Murakami for Vans. Naturally both were sold out instantly online and in stores. I thought one can only get Murakami for Vans in stores so I had planned out which ones I would go to first. But later I found out that they were also being sold online from various outlets! Wish I had known!!! There were a total of 6 designs for women and men. The shoes were unisex. But basically they have two distinct patterns. One is smiley flowers and the other is skulls. The flower ones came in multi-color, blue, and silver on white. The skull ones came in yellow, blue, and gold on white. He also did three different skateboard decks: skulls, smiley flowers, and self portrait. Additionally, there is three different t-shirts and three different toddler shoes. Sounds like tons of stuff to buy! I found there were only three stores in SF bay area that had them. And only the Berkeley store carried the skateboard decks. I made the decision to go to the SF ones instead because the Berkeley one did not carry silver flower on white vans which is the one I wanted the most. Although I would be very happy to settle for a pair of blue flower or multi-color flower. I got to the store about 15 minutes before opening. There were about 15 people in front of me so I was a bit nervous... thinking they may ran out of shoes. Apparently some of those people were there to pick up their Yeezy shoes and not Murakami for Vans. When I got into the store, they were sold out all the flower t-shirts (which I'm not sure I wanted one anyway) and self portrait t-shirt (only S left). I was pretty sure I wasn't going to fit into the S so I let it pass. They also sold out of multi-color flower vans. I was able to get a pair of silver on white flower shoes in my size (woohoo) and a pair of blue flower shoes a half size bigger than I would normally wear (hurray). Apparently that was the last pair of blue flower vans they have left. As I was leaving, I saw about another 10 people waiting in line. I hope they get what they were looking for. I did ended up trekking to Berkeley to see if they had anything left. They were wiped clean and had only a pair of yellow skull vans (but a size too small for me) and a pair of blue skull vans (a size and a half too small for me). I did see them put those two pair up the following day online which of course they were gone in a nano second. I checked on Ebay and apparently that's where all the shoes went. Although honestly they must have released very few pairs at each store as I checked for my size, there really isn't that many available. The skateboard decks turned out to be the hottest item on Ebay as I expected they would be. Most of them are selling for around $600 a deck at the low end (retailed for $80 each) and the most sought after multi-color flower ones are trending around $1000!